Roma on Bungil Gallery is giving art lovers of the Maranoa Region the rare opportunity to view works by renowned Australian landscape artists including Gordon Shepherdson, John Caldwell, Michael Nelson Jagamara, Davida Allen, Sybil Curtis, Maureen Hansen and Joe Furlonger. The exhibition, Tattersall’s Club Landscape Art Prize has been curated by Bernie Hollet, the Club Art Curator, and with the support of Museums & Galleries Queensland will tour to 6 venues in regional Queensland in 2016 – 2017. Since 1990, Tattersall’s Club has conducted its prestigious national art award, which has allowed the Club to acquire significant paintings by well-known Australian artists. Many artists who have won the Tattersall’s Club Landscape Art Prize have been finalists or winners of major Australian art prizes such as the Archibald Prize, the Wynne Prize, the Sir John Sulman Prize, the Portia Geach Memorial Award, the Moran Art Prizes, the Glover Prizes and the Fleurieu Art Prize. The 15 artworks in this exhibition have been selected because of their connection to Queensland – many locations depicted are Queensland landscapes. Collectively, they present a diversity of ways of viewing and interpreting our landscape. The exhibition features a range of painting styles including traditional, contemporary, narrative, industrial and urban, by mid and senior career artists. 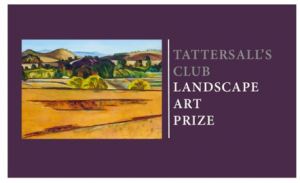 Tattersall’s Club Landscape Art Prize opens at the Roma on Bungil Gallery on the 24th February at 5.30pm, where it will be exhibited until the 9th April. The exhibition is supported by an Education Resource and a free curators talk by Ms Bernie Hollett, the Tattersall’s Club Art Curator, at 11am on Saturday 25th February at the Roma on Bungil Gallery. Thank you to our Major Sponsor, Santos GLNG. Open 9am to 5pm Mon to Fri. 9am-12pm Sat. 10am – 1pm public holidays. Admission is free.